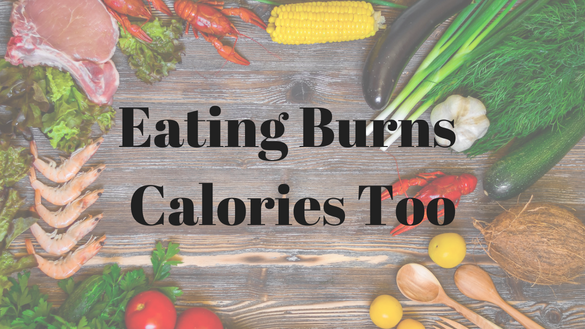 Yes, you read right – eating burns calories. The process is called thermogenesis (meaning heat generation) and it is designed to regulate body temperature -- to keep the body warm. A good way to visualize the process is like feeding coal into a locomotive steam engine: if you keep the fire stoked, by adding coal at even intervals, and not smothering it with too much, the engine will run efficiently and consistently. Can you increase thermogenesis? Increased thermogenesis means increased heat production, which means an increase in oxygen consumption (heat needs oxygen to be release), and higher metabolism. Sadly, there are many unscrupulous companies out there trying to convince overweight people to take herbal supplements (which aren’t regulated by the Food and Drug Administration) to increase thermogenesis. Some of the supplements contain compounds that have been shown to be harmful, so check with your doctor if you’re thinking about taking any. One bonafide thermogenesis increaser is green tea. The gain is modest, but it’s a gain nonetheless. The thermogenic effect also helps explain why severe calorie restriction often results in weight gain. When the body is deprived of food, some weight is lost the first few days (mostly water). The human body is a very efficient system, however. It doesn’t take long for it to kick into starvation mode, which is to say that it begins to conserve heat and fat by slowly the metabolism way down. The body adapts to the caloric restriction, and in an effort to prevent starvation learns to get by on less energy, just like an energy-efficient furnace. When you begin to eat normally again, your system has learned to treat any calories above subsistence level as energy to be stored, helping you to regain what you lost, and usually more! So eating food burns calories! Yes, some of the calories (very few) are burned in the act of chewing, but most of the calories are burned in digestion, assimilation and elimination of nutrients. Your body works hard in the digestion process, which requires energy: calories. This is known as the “thermogenic effect of food.” This effect accounts for five to 10 percent of your metabolic rate, so it’s wise to learn to use it to your advantage. Eat early. Metabolism naturally slows down during the latter part of the day, so eating doesn’t expend as many calories as in the morning and early afternoon. Burning off a big breakfast is easier than a big dinner. And if you must eat later, stick to protein and veggies. Pure protein has the most thermogenic effect of all foods (30 percent of its calories are used during digestion) so very lean protein foods will give your metabolism a little boost. The fiber and complex carbohydrates in vegetables also give your digestive system a strenuous workout, though not as much as they would earlier in the day. You may want to switch your workout time to early evening to further kick up your metabolism. Eat often. In the last 20 years, eating “mini-meals” has become a standard recommendation of nutritionists, and thermogenesis is one of the reasons. The other, of course, is because you don’t get as hungry and are therefore less likely to pig out on empty calories. It stands to reason that if you eat every few hours throughout the day (not junk, of course, but healthy stuff), your furnace will be stoked to burn hotter throughout the day. Eat complex carbohydrates & protein. When it comes to thermogenesis, all foods are not created equal. Take 1000 calories worth of broccoli and brown rice and 1000 calories worth of chocolate pie. In the first place, it’s unlikely you could consume that much brown rice and broccoli (that’s a lot of food!) But eating 1000 calories worth of pie is very easy to do. If you put both choices over a fire, they’d both burn up at the same rate. Not so in your digestive system. Your body has to work much harder (and therefore produce more heat) to break down the fiber and complex carbs in whole grains, vegetables and fruits than it does with simple sugars and carbs. Stick to whole grain foods like oatmeal, brown rice and whole grain cereals and breads instead of sugar and refined flour products like pasta, pastries and bread. Remember that complex carbs and protein give your body a workout, while junkfood slides right through almost unnoticed. Now obviously, this doesn’t give you license to eat more in the hope of revving up your metabolism more – the effect works on a parabolic curve, meaning that there’s a limit to how you can utilize thermogenesis. But follow the guidelines above, and you can make the most of your eating experiences. And remember: your metabolism is like a furnace – it needs adequate fuel to burn efficiently. Reducing calories too drastically is not only dangerous, it’s actually counter-productive.